• Sift together the flour, baking powder and salt into small bowl. •In a larger bowl cream the butter and sugar together until smooth. Mix in the egg. Add the dry ingredients alternately with the milk and lemon extract and blend. Cover in wrap and chill overnight. Cut off a piece of dough and roll out on a floured dry surface. Add more flour to the dough until no sticking occurs. 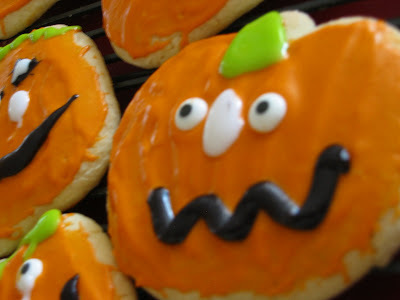 Use your favorite cookie cutters than transfer shapes to a greased cookie sheet. 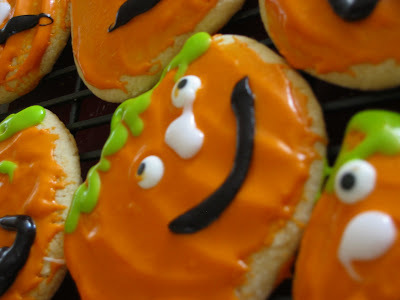 Bake for seven to ten minutes. Stir confectioners' sugar, corn syrup, and water together. 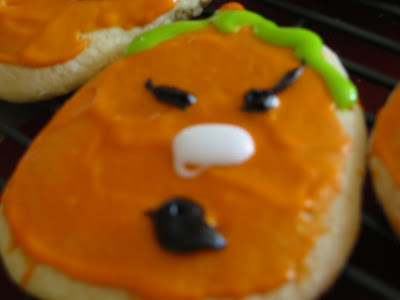 Stir in food coloring if desired. 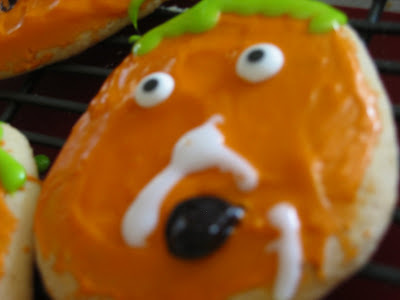 This glaze must be stirred each time you use it. If it is not stirred before each use it will dry with a mottled look instead of a solid color. To the uninitiated, buah keluak is a black nut from Indonesia about the size of a misshapen golf ball. The surface is ridged with a smooth nut 'mouth' across the flattest part. A slit is made in this mouth through which one scrapes out the contents which have been variously described as 'opium' and soft tar'. . Good nuts, when cooked, should be richly black and oily. To prepare Buah Keluak or Indonesian Black Nuts, wash and scrub throughly until the thin film of dried mud they come in is completely gone. A proper and crucial step in cleaning is desired otherwise the gravy will be not be good eats. Soak in a large pot of water over-night or for at least six hours. An even quicker method is to boil the keluak for 15 minutes, which, I'm told by friends, works just as well. Most recipes will suggest that the contents of the nut be dugged out, to be mashed and mix with egg whites for binding. 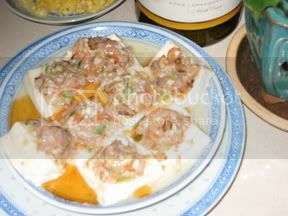 An addition of ground pork/chicken or prawns can also be added and then this mixture is stuffed back into the nut shells. 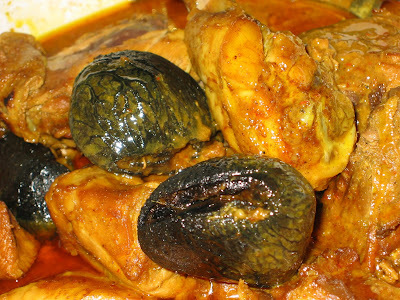 However, really authentic , according to Agnes, Buah Keluak is cooked with the insides of the nuts and are served neat, in all their bitter glory. The resulting curry is literally black, with a slight orangey sheen of oil that you will either love or hate. To me, it was love, thank you Agnes for giving me the chance to experience the buah keluak's glory. I was also told that if not properly prepared for cooking, the nut is toxic and since all my friends who tasted my dish are still around and kicking, i am glad i did not kill anyone. Soak nuts in cold water for at least 6 hrs or overnight. Brush nuts t remove mud and sandy particles. Crack where nut is smooth. Marinate chicken pieces with 1 tsp salt and pepper for 1/2 hr. Heat wok with a tsp of oil and brown chicken pieces. Remove chicken pieces and add in more oil. Add in the garam assam paste and saute until fragrant. Add the tamarind juice and bring contents to the boil. Add in the pork ribs and saute well. When contents come to a boil ,reduce the heat to medium, cook the pork ribs for 1/2 hr covered. Add the nuts and the browned chicken pieces. Continue to cook for another 1/2 hr, stirring occasionally until chicken is cooked and pork ribs are fork tender. In the food processor, grind A into a fine paste, then add in the rest of the ingredients. Blend well. If using the blender, put all the ingredients in including the oil and blend to very fine. Pour blended ingredients into a microwable bowl and microwave on high for 5 minutes, stir and continue to cook on high until oil surfaces and paste is fragrant and almost dry. Paste is ready for cooking but it has to be completely cooled before packing in airtight freezer containers. It's a refreshing dessert, a perfect finish to an Asian meal, especially after heavy stuff like curry. It's served cold, so it's great for summer too. It is easy to make and oh so impressive to serve. 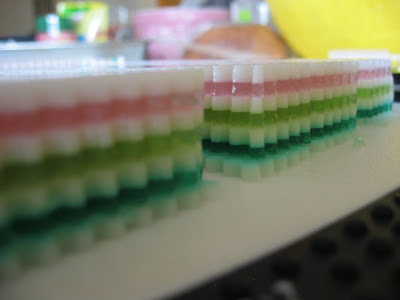 Colorings - green is a must and i use pandan paste, it not only gives the green, it fragrants the whole jelly. 1. 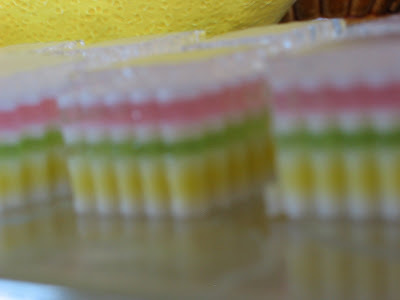 Boil above ingredients for the transparent layer except colourings till dissolved. Sieve mixture and return to pot. Leave it on the stove on the lowest heat or doubleboil to keep the mixture warm until the coconut layer is ready for assembling. 2. Boil the agar agar, sugar and water for the coconut layer till dissolved, then add in coconut milk and salt. Sieve mixture and return to pot. Leave it on very low heat . Do the same alternating between the transparent layer and the coconut milk layer until all the agar agar have been used up. 3. Leave the whole jelly to cool down before refrigerating it for at least a few hours. This is a Straits-born Chinese Wedding Speciality and it is a dumpling filled with spicy prawns. 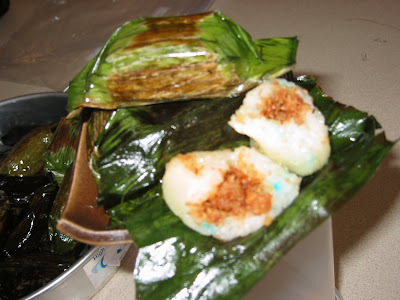 Another version is called Pulut Panggang of which the filling is different, dried prawns are used instead of fresh prawns. I was asked by a friend to translate a recipe in malay and it is called Pulut Lepa. I have not heard of this one before and i guessed the name changed cos this filling has fish meat. 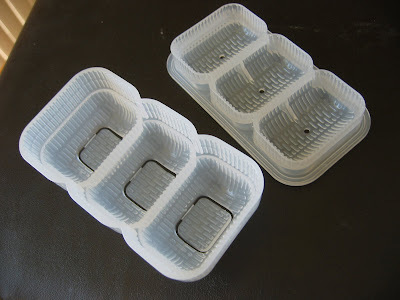 I have added a picture of the sushi mould used to form the cylindrical shape. banana leaves cut into 6" x 3" wash, wipe dry and greased. Place glutinious rice in a muslin lined steamer with the pandan leaves. Make steam holes with the handle of wooden spoon and steam over rapidly boiling water for 20 minutes. Remove glutinius rice into a saucepan. Pour in the coconut milk, salt and sugar and mix well. Cover saucepan and let sit for 5 minutes. Return to steamer and steam for another 15 minutes until cooked. Cover to keep warm until ready to assemble. Grind shallots, lemon grass, garlic to a fine paste, then add in the coriander powder and kencur. Fry grated coconut in a very dry pan until brown and frangrant. Do not over-fry until oil is extracted. Put aside. Heat oil and fry the ground ingredients until fragrant. Add the chopped prawns and salt. Stir well until ingredients become dry. Finally add in the coconut. Using the sushi mould, press in glutinious rice making a trench for the filling. 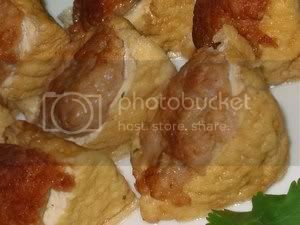 Put a spoonful of filling in the trench and top with more glutinious rice and press down to form into a cylindrical dumpling. Remove from mould into a piece of greased banana leave. Roll up the banana leave and fasten both ends with stapler pins. Repeat this process until all rice and filling are used up. 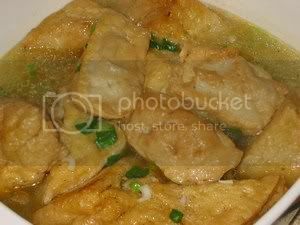 Heat 1 tsp oil in a nonstick pan and pan fry the dumplings until heated through. Tofu/taufoo, however you call it or in whatever forms is my favorite staple which needs no introduction but just for reminiscing, i miss the tofu from Malaysia, - the 'sang far', 'sui tofu' and 'tau khon/taukuah'. To 'yeong' in cantonese which means to stuff, Besides all forms of tofu or soy products, any vegetables can be stuffed. Leafy vegetables like 'kangkong' or 'choy sum' can be blanched and twirled up and then a patch of fish paste is added. Blanched Long Beans made into a small bundle is one of the best. The other popular candidates for stuffing are 'red and green peppers', 'fu chuk', okra, eggplant and all types tofus of course. I personally like to stuff 'shitake mushrooms' and cabbage. 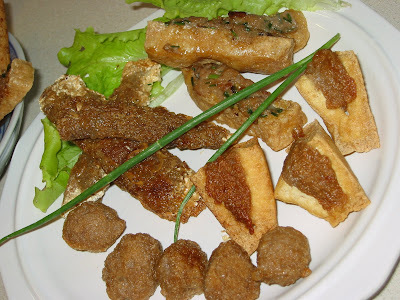 The stuffing filling of just fish paste is the most common but the 'hakka' version of adding ground pork and salted fish is very flavorful especially with 'sang far' tofu. In the absence of 'sang far', the silken tofu is cut into squares and using a melon baller, scoop a hole to hold the filling and then steam or alternatively, cut the tofu into triangles and stuff the fish paste on the pointed side of triangle instead of the straight side which is too tricky. The paste can be made into balls which are then cooked in simmering water/stock or made into a log/disk and pan-fried. 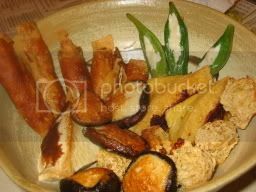 The stuffed tofus or vegetables are pan-fried or deep-fried and is served as is with chilly sauce for dipping. They can be served with a light thin sauce made with 'mein see/tau cheong' or in soups. i especially like the soup that is made with soya beans. At this stage, they can be kept in the freezer but not for the stuffed white silken tofu. They are the best accompaniment for noodles. Put the fish fillet in the food processor and pulse until the fish is finely chopped up. The number of pulses depend on the freshness of the fish meat. Remove from food processor and put minced fish meat in the cake mixer mixing bowl. The paste is ready to 'yeong'/stuff whatever.